For the past few weeks, we've had the pleasure of watching a DVD from Dive Into Your Imagination. Not only that, but we've also been able to work with a brand-new Educator Guide for students in Grades 1-3. 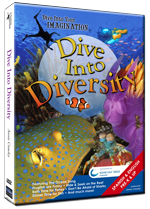 Dive Into Your Imagination has a number of ocean-related videos, and as part of the TOS Homeschool Crew, I had the chance to review Dive Into Diversity. Ocean Annie was trained as a photo and broadcast journalist, but learning to SCUBA dive changed her life. She started Dive Into Your Imagination to help the next generation to learn about the ocean, and about themselves too. The Educator's Guide is something brand new. For Dive Into Diversity, there are actually FOUR pdf files -- two for grades PreK-K and two for grades 1-3. I looked at the PreK-K one, but determined we were best served by working with the Grade 1-3 one for Trina (rising 1st grader) and Richard (rising 3rd grader). Thomas (rising 6th grader) sat in on almost everything we did too. The Guide is split into two parts based on the chapters listed above. So chapters 1-4 are covered in the first guide, and chapters 5-8 in the second. Over 300 pages total, it includes roughly 35 pages per chapter. We are easily able to spend a week on a chapter. For the first one -- the Night Diving one -- we found eight books that were recommended in the study guides (okay, so I did look at the PreK-K guide for the book list!) and we read one or two of them a day. Fabulous books, I'm telling you. And I love, love, love read-alouds. Each chapter has a treasure chest of words. Some of these were a bit much for Trina, but Thomas ended up spending time pulling out the Greek/Latin roots. Words like bioluminescence, and piscivore were a lot of fun to explore. Many of the words were well-known to us already, such as carnivore, herbivore, omnivore, predator and prey. Other activities we did with chapter 1 included discussing trust (there is a character trait emphasized in each chapter of the guide), playing a game with flashlights and codes (related to how divers communicate when night diving), and doing a code worksheet. Trina loved coloring some of the pages included in the guide. There are also really cute journal/notebooking pages and some other worksheets. We primarily focused on the reading suggestions and some hands-on. But there is a lot more. Some is, I should warn you, fairly classroom oriented. But I just chose the activities that appealed to me and to my "classroom" situation at the moment. There are plenty to choose from. The DVDs are available for $19.99 at Annie Crawley's website. The guides -- right now -- are available for free if you mention in the comments that you homeschool and that you would like a pdf copy of the Educator Guide. That's a $70 value. Disclaimer: As part of the TOS Homeschool Review Crew, I did receive products as mentioned above for the purposes of a review. All opinions are my own. For more about my take on reviews, visit my blog post here.